The images of starving children bear grim witness to the extent of the crisis affecting millions of people in the Horn of Africa, but they also symbolize a failure to act in time, say aid experts. "It is a colossal outrage that the warnings went unheeded, that the lessons of previous famines have been ignored," says Barbara Stocking, chief executive of Oxfam. The crisis in the Horn of Africa, triggered by drought, conflict and high food prices, is affecting at least 11.6 million people, with two regions of southern Somalia suffering from famine. And the situation may well deteriorate. But the crisis, experts say, could have been mitigated by mobilizing the necessary resources ahead of time. There is increasing evidence that helping people become more resilient to the naturally recurring cycles of drought is far more effective than responding after disaster has struck. It is also sound use of donor money, they say. As such, helping farmers find alternative livelihood options, or teaching them to grow drought-resistant crops, is far more effective than providing food aid when the harvest has failed. "We have hard evidence, including from Africa, that we need only five Swiss francs [US$6.20] per capita per annum to build up resilience,” said Mohammed Mukhier, who heads the Disaster Risk Reduction unit at the International Federation of Red Cross and Red Crescent Societies (IFRC). “If you take the emergency response and emergency operations, you might need 200 francs [$250] per capita to deliver relief assistance for periods of just three or four months." Humanitarian agencies and donors agreed at an emergency meeting in Rome on 25 July that the response to the crisis must address the immediate needs of the desperate population and help build resilience to avert similar crises in the future. Using donor money wisely is particularly urgent in view of the threats posed globally by natural disasters, including increasingly frequent storms, floods and droughts. Advocates of the risk reduction strategy argue that donors can no longer afford to provide funding for disasters primarily after the fact. The cost is rising and compromising regular development investment. Yet, warnings of impending disaster in the Horn of Africa went largely unheeded. "Measures that could have kept animals alive – and provided milk, and income to buy food – would have been much cheaper than feeding malnourished children, but the time for those passed with very little investment,” said Simon Levine, of the Overseas Development Institute. Now, "it is far too late to address anything but the worst symptoms", he wrote on the website of the independent British think-tank. While massive funding often goes to post-disaster response, funds for preparedness and contingency planning are relatively scarce. Risk prevention is often hard to fund as it does not generate the same kind of media as a high-profile emergency response. Government donors answer to taxpayers and need to demonstrate impact – something that is difficult to do when disaster has been averted. With donors mobilized - even if funds pledged still fall well short of the US$2 billion needed – the focus in the Horn of Africa is now on emergency as well as long-term assistance. “Short-term relief must be linked to building long-term sustainability," said UN Secretary-General Ban Ki-moon. "This means an agricultural transformation that improves the resilience of rural livelihoods and minimizes the scale of any future crisis. It means climate-smart crop production, livestock rearing, fish farming and forest maintenance practices that enable all people to have year-round access to the nutrition they need." Kanayo F. Nwanze, president of the International Fund for Agricultural Development (IFAD), stressed that building resilience in farming and herding communities required a long-term commitment. "But time - as we can see from the devastating situation in the Horn of Africa - is running out,” he told delegates at the meeting in Rome. 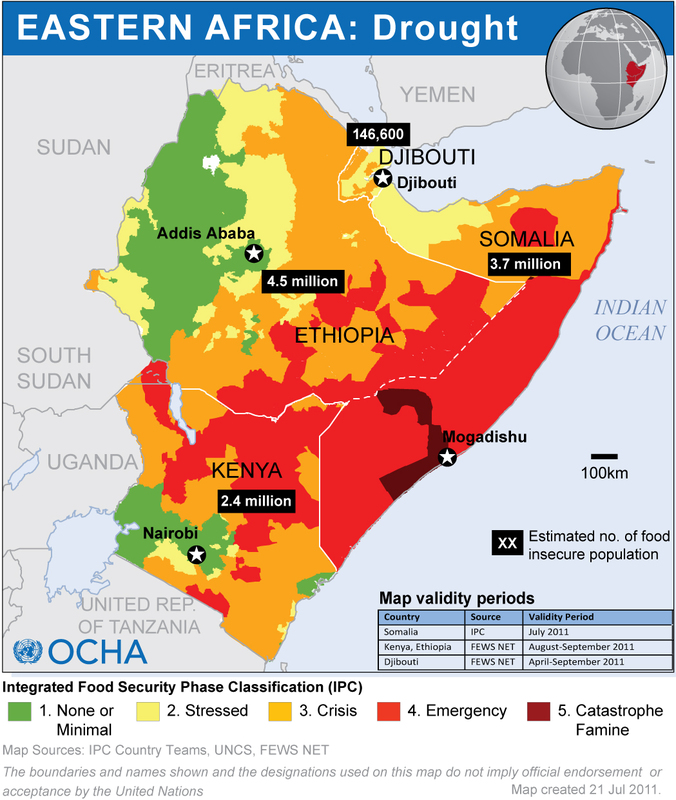 The challenge of seeking to avoid future food insecurity crises in the Horn of Africa is daunting. Conflict has severely hampered development and relief efforts in Somalia, and affects the mobility of pastoralists and their livestock, which is key to food security in the region. But disaster risk reduction is increasingly seen as a humanitarian imperative, crucial to battling poverty and achieving sustainable development. “Building resilience of farming and herding communities in East Africa requires a long-term, sustained commitment on the part of the region’s governments and the international donor community,” said Kevin Cleaver, IFAD's associate vice-president. "The rains will fail. But let us not fail, too."